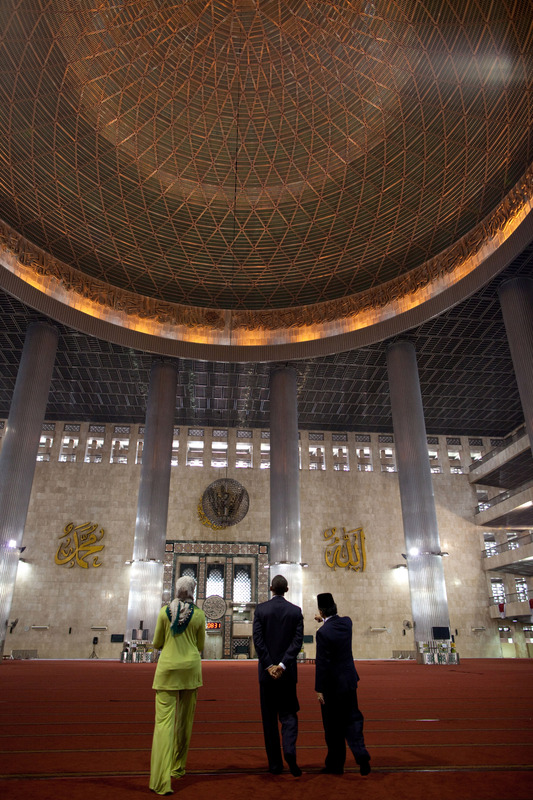 President Barack Obama and First Lady Michelle Obama visit the main prayer hall during a tour of the Istiqlal Mosque with Grand Imam Ali Mustafa Yaqub in Jakarta, Indonesia, Nov. 10, 2010. (Official White House Photo by Pete Souza) This official White House photograph is being made available only for publication by news organizations and/or for personal use printing by the subject(s) of the photograph. The photograph may not be manipulated in any way and may not be used in commercial or political materials, advertisements, emails, products, promotions that in any way suggests approval or endorsement of the President, the First Family, or the White House.